God always has a plan for you, a key for every problem, a light for every shadow, a relief for every sorrow & a plan for every tomorrow. This week my sister Dana threw me the cutest baby shower! Everything even the food was all pink and brown just like Hallie's room. Everything was so cute! I got tonz of gifts! Hallie is so spoiled!!! Thanks Dana! Im having more contractions so hopefully she'll be here soon. I have a dr appointment today and im just hoping something has happend and they'll start me! 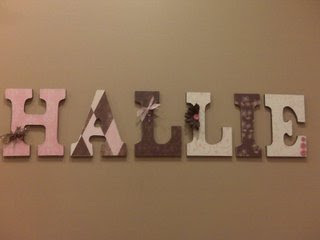 Hallie is almost here! She seems to be alot like her mom she wants to come early!! Thats not so much fun for me...Without working im bord out of my mind! Ive done all the projects I can do, Blankets, birp cloths, bows, now i have nothing to do. Hopefully she comes this week! I cant wait to see her! Thank Goodness its a GIRL!